Ok, now this is something I haven't done at all before. 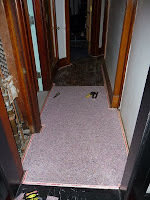 Install carpet. How hard can it be? 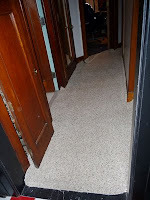 Well, we had all this carpet left over from carpeting our bedroom so I measured and calculated and decided that the left over pieces would indeed fit down the hallway and all the way to the front door and I could finally get rid of that nasty carpet without really spending a lot on a "temporary" solution. 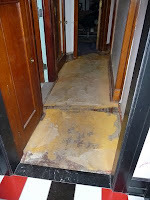 So 2 days before my knee surgery I went to the Depot and purchased what I would need to do the job: tack strips, padding, seam tape, knee kicker... and start ripping out carpet and cleaning up the wood floor underneath. It was about as bad as I imagined. 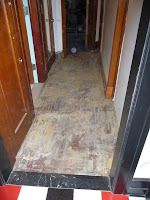 I wasn't able to finish the carpet installation because I had to leave for knee surgery. Yes, I tore that darn meniscus again... more to come on that. 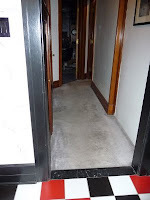 But anyway, I did get the carpet fitted down and the only things left to do now is the seams, the knee kicker, trimming, and tucking. At least that's what I'm telling myself. It will be quite a while before I can finish the project but in the meantime I'm enjoying the new feel! 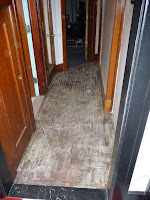 Before: this carpet must be 25 years old!